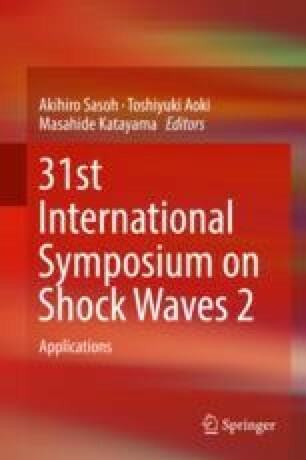 Understanding the shape of curved axisymmetric shock waves in supersonic intake-type conditions allows one to better design for downstream compression and heating requirements. Numerical results were obtained for ring wedge models with varying internal surface curvatures and wedge entry angles at different flow Mach numbers. Experimental results were obtained to validate the numerical method. A general power law fit which describes the shape of continuously curved axisymmetric shock wave segments was determined via curve fitting numerical results. The relationships between the curve fit constants in the general curved shock wave shape equation were shown for the models with a wedge entry angle of α = 4° between Mach 2.9 and 3.6. The curve fit constants were found to be self-similar in nature which promoted the process of characterising them with respect to normalised internal radius of curvature and flow Mach number. This resulted in a proposed empirical model which could predict the shape of the continuously curved axisymmetric shock wave segments within particular justified parameter limitations.